In Skyrim, you have the option of marrying an NPC, regardless of race or gender. To do so, you must complete the quest The Bonds of Matrimony, which involves speaking with Maramal about marriage and wearing an Amulet of Mara which signifies that you are available to be married. Once you have found an NPC who also wishes to be married, and whose disposition towards you is high enough, you can gain their consent to marry you and then attend the wedding ceremony at the Temple of Mara. After the wedding, if you speak with your new spouse, you can determine where they will live. If you own property, your spouse can move in with you; alternatively, if your spouse owns property, you can move in with them. Spouses will provide a variety of benefits after marriage, such as homecooked meals. When you marry, your spouse becomes protected. There are several ways to obtain an Amulet of Mara. The simplest way is to head to the Riften Temple of Mara and buy one from Maramal for 200 gold, but they will also show up in random loot and at merchants. You receive one during the Book of Love quest, which you keep when completed. You will not be able to marry anyone until you have spoken to Maramal about marriage, even if you have already obtained an amulet from somewhere else. Maramal can be found in the Temple of Mara, but will initially be found in the Bee and Barb. When you approach an eligible NPC, they may mention the amulet you are wearing. In order for this option to become available, you must complete their objective. Even if a character is flagged as marriageable, the Radiant AI system may not allow you to marry said character even if you have completed their objective, so it's best to have at least one backup candidate. You can then ask if they are interested. They will respond and ask if you are interested as well. If you say yes, you can then proceed to marriage. In order to complete the event, you will now need to travel back to the Temple of Mara in Riften and arrange the event. Wait 24 hours and leave the temple then wait for the objective "Attend your wedding ceremony" to be displayed. Head back into the Temple of Mara and the wedding will begin. The wedding ceremony will begin with Maramal saying, "Ah here's the blushing bride / proud groom now. Let's begin the ceremony. It was Mara that first gave birth to all of creation and pledged to watch over us as her children. It is from her love of us that we first learned to love one another. It is from this love that we learn that a life lived alone is no life at all. We gather here today, under Mara's loving gaze, to bear witness to the union of two souls in eternal companionship. May they journey forth together in this life and the next, in prosperity and poverty, and in joy and hardship. Do you agree to be bound together, in love, now and forever?" "I do. Now and forever" : Maramal will then continue on to say, "Under the authority of Mara, the Divine of Love, I declare this couple to be wed. I present to the two of you with these matching rings, blessed by Mara's divine grace. May they protect each of you in your new life together." "Stop the wedding! I can't go through with this" : Maramal will go on to say "You're just going to walk out on your betrothal? Get out of the temple now!" If you try to speak to the rejected NPC afterwards, they will only say "Get out of my sight." Trying to speak with Maramal or any of the guests that attended the wedding ceremony will greet you with "Just leave." or "Get out." If you go through with the ceremony, the wedding guests will congratulate you on the wedding. You should talk to your spouse before they leave the temple to discuss living arrangements. They will open up the conversation by saying, "Married? It doesn't feel like I thought it would, but I'm happy. We're married. I guess we'll need to decide where we're living, won't we? You can always stay with me." You can then choose either to live at your spouse's house or one of your own houses. This decision can be changed later. In the base game, a spouse will move into any house you own. For Hearthfire houses, you must have built a bed for your spouse. If you have children, you will need to have purchased the children's bedroom, or have built enough beds for them, as appropriate for the type of house. Upon visiting your spouse in whichever house you have chosen, you will be able to ask them about money earned from a store they will have established. Starting the next day, you will be able to collect an accumulating daily income of about 100 gold from your spouse regardless of where he or she resides. In addition, if your spouse has moved into your house with you, he or she will become a merchant, allowing you to buy and sell general items. However, any income your spouse makes from selling items to you does not affect the separate daily 100 gold your spouse makes for you. "It was a mistake. Can we start over?" : They will agree to start over, and you will be given a second chance at marriage. Speak to Maramal to arrange your wedding, where he will forgive you and allow you to continue with the ceremony again. You can keep repeating the process several times unless you choose to go through with the wedding or choose the option below. "I never loved you anyway." : This will mean that you can never marry that specific NPC again as that NPC will start to dislike you. You can marry another eligible NPC after they express interest. A player's spouse will prepare one homecooked meal a day, which will boost health, stamina, and magicka regeneration by 25% for 600 seconds. Note that though there is a unique dialogue option for each spouse character when asked to prepare this meal, the item received will always be the same. Spouses that are also followers can still follow you, and you can still exchange equipment and items with them. They will still prepare meals for you, even if you are away from your home. Your spouse may occasionally surprise you with a gift. Your spouse will set up a store "somewhere" and earn a cumulative 100 gold or more a day for you. If your spouse moves in with you, they will purchase and sell general goods with you. If your spouse is naturally a merchant, they will buy and sell the same goods they would normally. If not, they will sell miscellaneous goods and seemingly items you leave in their inventory. You don't need to worry about losing items by placing them in your spouse's inventory because they sold them to someone. Like all merchants in the game, they will actually only sell things to you, and not other people. This inventory is randomized and seems to reset once a day (along with the amount of gold your spouse has to offer). Your spouse will not give you additional discounts for being a spouse; prices are still defined by your Speech skill and perks. Sleeping (even for just 1 hour) near your spouse will give you the resting bonus "Lover's Comfort", allowing skills to be improved 15% faster for eight hours. Note that this can be used in any unowned bed anywhere in Skyrim, including those in caves and other hostile areas, provided there are no enemies around - very useful if your spouse is also a follower. This effect stacks with the Mage, Warrior and Thief stones. This effect does not appear if you have the effect from The Lover Stone active. You can use the Aetherial CrownDG to store the effect of the Lover Stone; if you take the crown off before getting into bed, then put it back on, whatever effect it has stored will stack with "Lover's Comfort". This effect (like all other sleeping bonuses) does not work if you're a werewolf. If your spouse is a follower, move into their house first (even if it's actually your house) then into your preferred residence to benefit from "Lover's Comfort". The Dawnguard add-on allows you to turn your spouse into a vampire as a part of the Volkihar clan quest The Gift. This does not work as normal vampirism does, however, as your spouse will still show up with the Detect Life spell and will not use Vampiric Drain. Also, some spouses will not have glowing orange or red eyes, unlike other vampiric NPCs you will find throughout Skyrim. With the Dragonborn add-on installed, spouses obtain a more bat-like face with a split down the middle of the lip or, in the case of an Argonian, a split across the whole face. If your spouse has property, you can elect to move in there. Items you place inside their property will not disappear. If you have purchased a house, your spouse may instead be told to move in with you. However, a spouse cannot move into free houses, quest rewards, or faction houses -- only homes which you have purchased. If you have Hearthfire installed, then this includes houses that you have built which have an available bed for your spouse. A spouse's property can be a business property, living property, or both. The property can be anything from an entire house, a single room in a house, or even just a pub/hotel (which they do not actually own), like the Bee and Barb. A spouse's business property may no longer sell items after you move in. If your spouse lives at their own property, they will live normally like before, visiting different places and doing different things. If your spouse moves into your house, they will never leave home, unless they are a follower and you command them. Do note that it may take some time for your spouse to appear at your home, as they actually walk all the way from Riften. If you do favors for someone, you may normally sleep in their bed and take some of the cheaper items in their house without it counting as theft. However, the more expensive items they own cannot be taken without counting as theft, and expensive items placed in their containers will become their property. Once married, taking things that belong to your spouse and things placed inside containers they own is no longer considered stealing, as long as the items are worth no more than 500 gold each. If their house is normally locked, you need to initially move in to their house to get their key. The spouse's property may amount to nothing more than a bed. For example, Dravynea the Stoneweaver's home is in Braidwood Inn, but she only owns a bed inside a small room, and she shares that room with others who still live there after you marry her. None of the chests and items in the small room and elsewhere in the inn belong to her. To make the matter even worse, you can already sleep in her bed before marriage after doing her a favor, so getting her property (a bed) after marriage is not a good investment. Renting a room in Braidwood Inn only rents out the master bed for 24 in-game hours, and has no effect on surrounding chests or items. Note that if your spouse shares ownership of a house with someone else before marriage, other people will be living there after marriage even if you elect to move in with them. If a spouse is flagged as a merchant, and there is already someone else that shares the business property with the spouse, your spouse may not be a merchant until that other person (or persons) are dead. If you are near the beginning of the game and don't have enough money to purchase a house, you can marry someone with a house and use that until you get enough funds of your own. The table below lists the property owned by all available spouses. Almost all spouses own at least a bed. The blank spaces in Spouse's Property may be incomplete. Please fill in missing information. The blank spaces in other columns are correct and means "no" or "none". †The "Merchant" column lists only the merchant type for those NPCs who were already merchants prior to marriage. Some entries in this column are marked with an asterisk(*). These merchants share their merchant gold and inventory with another NPC. These two tables give details on all of the possible spouses, including their race, location, what property they own (if any), ability to follow, merchant type (if already merchant before marriage), training possibilities, and any special prerequisite tasks for that specific marriage prospect. A follower spouse is able to go with you on quests and take orders. Your spouse does not become hostile if you are caught stealing from them, but won't let you steal anymore. The gold they carry is separate from the merchant gold they get from bartering (you can't steal that). Lydia Nord Whiterun (Dragonsreach or Breezehome) Bed (Breezehome) Yes Complete Dragon Rising and purchase Breezehome. Player must kill Nilsine as well. Must be proprietor of the store to sell Apothecary merchandise. Taarie High Elf Solitude (Radiant Raiment) No Clothing Invest in her store. The merchandise that your spouse will sell you depends upon whether or not your spouse was originally a merchant and, if so, what type of merchandise they originally sold. In each case, the merchandise is typical of a generic merchant of that type. All standard merchandise is located in a Merchant Chest; it cannot be pickpocketed or stolen. The merchant chest is restocked every two days. Also, if you buy any items from your spouse, the gold is placed in the merchant chest, not in their personal inventory, meaning you cannot take it back from your spouse, even a follower spouse. These are the goods sold if your spouse was originally an apothecary merchant. These are the goods sold if your spouse was originally a blacksmith. These are the goods sold if your spouse was originally an innkeeper. These are the goods sold if your spouse was originally a spell merchant. The GiftDG: Turn your spouse into a creature of the night. There are no Khajiit, Bosmer, male Redguard or male Altmer characters that you can marry (without using console commands on the PC version of the game). Maramal says to meet back "tomorrow, from dawn til dusk". Technically this is incorrect; he will conduct the ceremony any time after midnight, provided a whole number of hours has passed since you asked him to conduct the ceremony. So, if you ask him to conduct the ceremony at 11:59 p.m., he will offer to conduct it a mere one hour later, at 12:59 a.m.
Certain quest paths and character interactions can make the disposition quests for some potential spouses permanently unavailable. If you wish to get married to a specific character, do so as early as possible to minimize the risk of this. Additionally, most disposition quests are in a radiant group with similar quests, only one of which can be active at a time, so doing a favor for someone else may make your intended's quest unavailable until you complete the "blocking" errand. There are only a few female spouse followers that can be turned into vampires with the Dawnguard add-on installed, such as Uthgerd the Unbroken and any female houscarl. If you are not sure what property a spouse has before marrying them, you can follow them and find out where they usually sleep at night. If they always stay in the same bed, that is usually their property. Next, check if the chests and items near the bed are named in red, indicating that to take from them is stealing. Do the favors or quests required by the potential spouse and check the chests and items near the bed again. If they change from red to non-red, then those items are your spouse's property. Note that some items owned by the potential spouse may not change to non-red until after marriage. Any items that change from red to non-red in your spouse's house after marriage belong to your spouse. Likewise, any items still red after marriage never belonged to your spouse. The same procedure can be used to verify bed ownership. A spouse can own an entire house or just part of it, especially if they live with other people before marriage. Special care should be taken with chests, as chests may be owned by other members of the house. A chest owned by your spouse after marriage is a safe place to put items, whether you move in or not. On console versions, the chest at the foot of Sylgja's bed is NOT safe storage for her spouse, though it seems she owns the entire property herself. Special care should be taken in determining what property is actually owned by your spouse. Being considered a friend after doing favors for them allows you to take items from where they live without stealing, but that does not mean the spouse owns the whole house. If you are not sure if your spouse owns a house or not, simply put items in chests inside the house AFTER marriage and after you have moved in. If your items disappear after a while, then your spouse probably only owns a bed, not the whole house. You can put items in different areas of the house (and inside chests) to determine the extent of the property owned by your spouse. Killing other members living in a business property will usually trigger your spouse to be the default merchant listed, to verify whether they are actually selling the stuff listed. If you kill the other merchant or merchants of a business so that your future spouse can become a merchant themselves, they may not give you the marriage dialog to start the marriage. This happens for Camilla Valerius and Muiri. If you decide to store stolen items in your or your spouse's home, some spouses will alert the guards if they see you take the items. This does not apply to stolen items in a container. If Hearthfire is installed and you have children, your spouse will mention that you will need room for them somewhere after getting married. Then proceed to marry as normal. Drop the Amulet of Mara from your inventory. Go to Riften and talk to Maramal. He will start the quest from scratch. It's possible that this doesn't work the first time you try it, and you may have to reload the game. Also, make sure you don't talk to Maramal before you dropped the Amulet of Mara. If your spouse becomes a Blade (either before or after marriage), then your spouse's home moves to Sky Haven Temple, although you can still move your spouse to a house you own. See Rebuilding the Blades for details. It is possible that if you married someone who was already the object of someone's affections (for example, Camilla Valerius), their former lovers may track you down and attack you. If the player used the following solutions on a spouse that was a merchant they will have to use the console to reinstate it. If one of your followers dies before the marriage can take place, their body will turn up at the temple, causing you to fail the wedding ceremony mini-mission. The priests will then ask you to leave, and the bride or groom will storm off, angry. You can make amends by leaving a short cool down period of a couple of hours, and then going and apologizing to Maramal and then your potential spouse. The wedding will take place the following day at the same time. To avoid failing the quest a second time, drag (or use unrelenting force to push) the corpse from out the way of the door. If you are using the PC, you can also use the console to resurrect the follower then apologize to avoid a problem. If your spouse dies, you will not be able to remarry. It appears that if you resurrect your spouse using the console then they are no longer married to you. You can still buy/sell merchandise, but other spouse dialogue is not available and, if you moved them to your own house, they no longer live there. 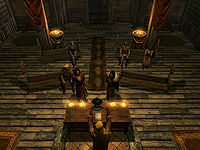 Although listed as possible marriage options, there have been many reports of some NPCs (Lydia being the most common example) as not having the dialogue required for marriage. This issue has been addressed by version 1.5 of the Official Skyrim Patch; it is unclear if any NPCs other than Lydia are fixed by this patch. This can also be fixed via the console by typing addfac 19809 1 after clicking on the desired NPC. This adds them to the potential marriage options faction. One day you may find your spouse no longer offers you a Homecooked Meal because the dialogue "Would you mind cooking something for me?" disappears. This can by fixed by remarrying via console (see the how-to in the notes). In most cases the NPC spouse disappears after exiting the Temple of Mara, unless you exit dialogue with Maramal and rush after them before they reach the door. If this happens, you may find your new spouse in the spot where you first met; you can then talk to the person to decide where you'll both live. In some cases, the spouse seems to disappear from the game completely. This is easily solved by using the console command player.moveto (NPC RefID), which will move you to the spouse position. Sometimes after your wedding is scheduled, within a few in-game hours, it may say to attend your wedding even though Maramal said it was supposed to be scheduled for the next day. Because of this, you may fail the mission automatically due to the time being unpredictable and makes your fiance mad, etc. The cause of this is not known, but can be fixed by reloading the last save before you scheduled the wedding. ? A very similar glitch exists that also makes the wedding take place the same day, but does not cause you to fail the mission. When the spouse disappears, the game still treats a spouse as "alive" even when they have disappeared forever. It is also possible for NPCs who attend your wedding to vanish forever in the aftermath, however this is considerably more rare and seems to only affect Camilla Valerius. If you move your spouse directly into your own home, the Lover's Comfort effect may not activate correctly on sleeping. This can be fixed by asking them to move back to their original home (you should get a "Visit your spouse's house" journal update at this point, if things are working properly) and sleeping there to activate the effect, then telling them you want to move to whichever house you actually want to live in. Alternatively, you can enable Lover's Comfort by using startquest relationshipmarriagefin and setstage relationshipmarriagefin 20 in the console, then either completing the quest as normal or using setstage relationshipmarriagefin 25 (there is no need for the spouse to move into their house, nor to for you to sleep there, so this also works in the event of the Hearthfire bug listed below). Spouses who stayed at inns before marriage may not actually sleep in those places, but Lover's Comfort should activate if you pay to spend a night at that inn. This is especially broken if you marry your Housecarl. Telling e.g. Jordis that you should live in your house in Solitude will not fix this bug: you have to use the conversation option for "their" house, even though it's the same place. If you have Hearthfire installed, and have one or two adopted children before getting married, you will not have a conversation option to stay at your spouse's home, even if you are marrying a housecarl of a house which has children's bedrooms installed in it. If you ask your spouse to move into a house with you, any items that you have stored in the house could disappear and show up under your spouse's Sale option. You will have to buy the items to reclaim them if they are lost. ? It appears that Speech is not a modifier for buying items from your spouse. You will be required to buy the items at full price if you want them back. With Hearthfire if your spouse is kidnapped they will start to walk backwards (as a follower) will not attack. ? This page was last modified on 21 December 2018, at 14:38.